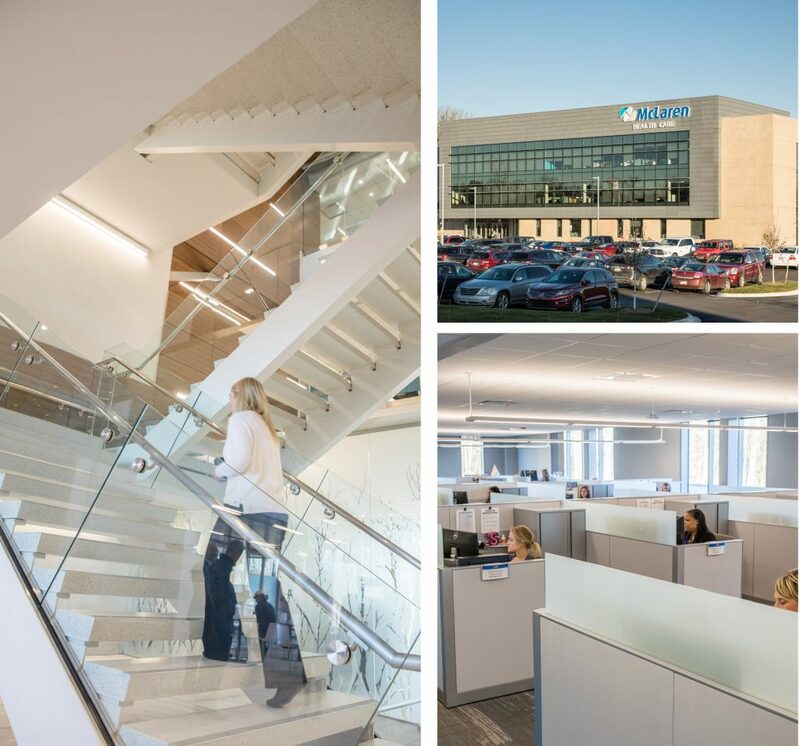 When you walk into the new McLaren Health Care headquarters in Grand Blanc Township, you are struck by the openness and beauty. 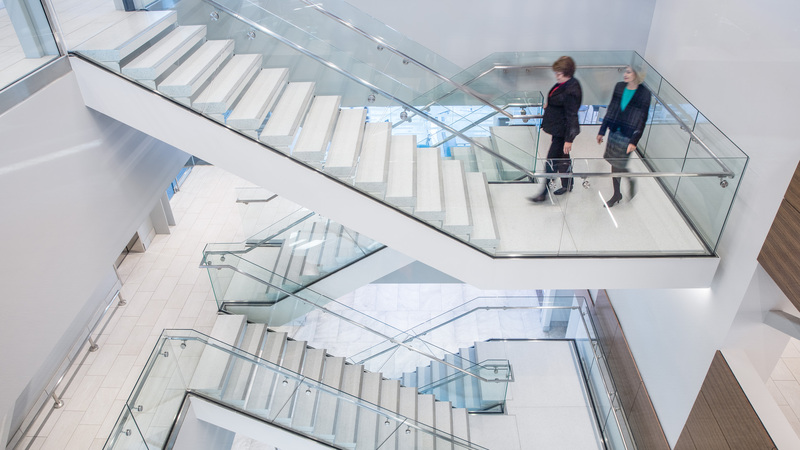 As you pass an etched glass wall, you see a glass staircase with white terrazzo steps that climb its three floors; and as you walk through workspaces, sunlight flows through large windows that look out onto acres of trees and grassland around the building. Yes, there’s beauty. Beauty with a purpose. Modern American workspaces have evolved to be much more than just functional. The design and “feel” have become a priority. The evolution is much the result of changing work styles created by the rise of mobile technology and the growing presence of millennials and decline of baby boomers in the worker pool, agree architects, design firms, and workers themselves. 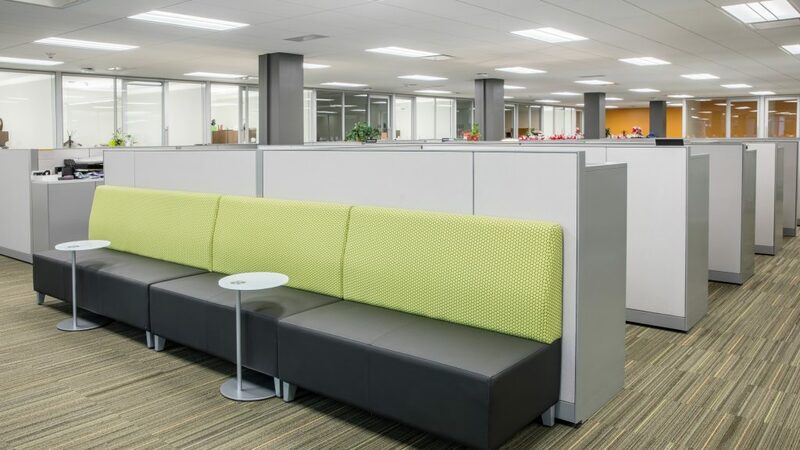 In a study by Gensler, an influential American design and architecture firm, 89 percent of U.S. office workers surveyed rated the importance of workplace design as “important” to “very important”; and 90 percent of respondents said that better workplace design and layout result in better overall employee performance. It’s not just the workers who see design as important. In the same study, 88 percent of C-level/upper management respondents said they believe that the workplace environment would have a positive impact on their company’s bottom line; 92 percent of respondents agreed that better workplace design can make a company more competitive. Companies that want to recruit and retain employees from that growing percentage of the workforce and others are tearing down walls, removing the perimeter offices and letting in more natural light. 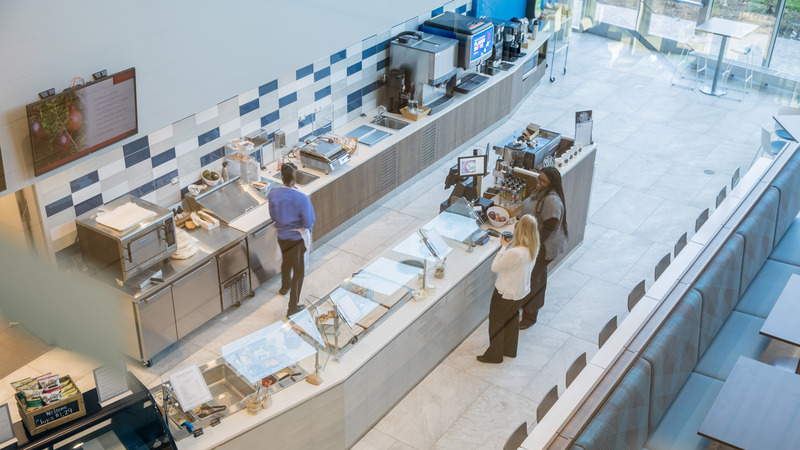 They also are opening up floor plans and replacing closed spaces with open workspaces, breakout areas with comfortable furniture, bar-height tables and stools, and cafes that offer more variety and healthy options. The desire for collaboration is a key driving force. The cubicle itself also has been modernized. 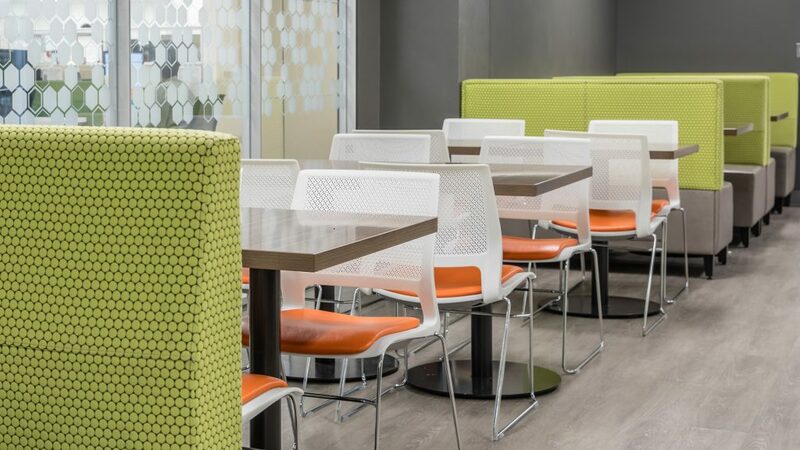 Now they have lower or adjustable walls, include writable surfaces, task lighting, desktops that have adjustable heights, and more comfortable and adjustable chairs. Even conference rooms have come of age. They often are exposed to natural lighting, and function has trumped fancy when it comes to furnishings and finishes. In addition, current technology is essential. Users must be able to access information wirelessly and project that to wall-mounted flat screens. To top it off, many designs raise the ceiling height to create the sense of more space. And to keep all that open space from getting too noisy, white noise fills the work areas. 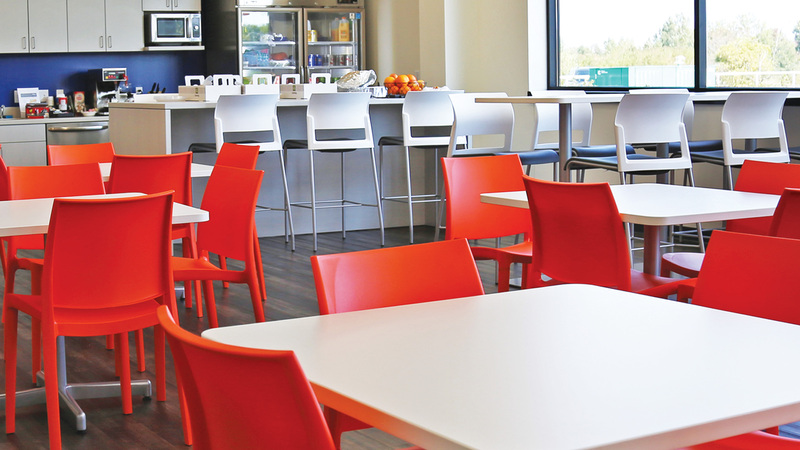 Following is a look into several local modern workplaces. When McLaren decided it wanted to bring together all its corporate workers into a new facility, executives saw it as a branding opportunity, said Daniel Medrano, corporate vice president of facilities management. “We thought, ‘What does the building need to say about our corporation?’ There was a desire to show vitality and strength, conservatism, and yet incorporate progressive ideas for new workplaces,” he said. An example of how this was accomplished is how the design of the boardroom creates a conservative and strong feel with its long table and color scheme, but the open work areas feel more progressive and collaborative. 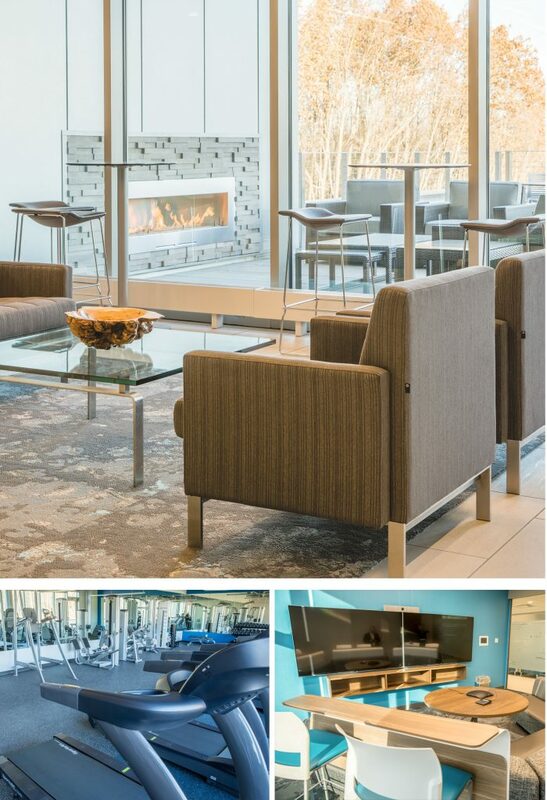 The progressive design includes modern light fixtures, large windows that bring daylight deep into the building, outdoor balconies with seating on each floor, and an outdoor fireplace on the third, work spaces with adjustable desks, and upscale furnishings throughout. Even the building was situated on the 23-acre site to incorporate the natural beauty of the land to create a campus feel. It takes advantage of natural light on the south side of the building but also opens up the east side to the natural landscape, where there will be hiking trails and outdoor exercise areas just beyond the indoor exercise room. The executives on the design committee told Smith GroupJJR that the building needed to have many “coordination points” so the once far flung colleagues could be more personal with each other, Medrano said. They accomplished that by creating many gathering areas — from “huddle rooms” where a small number of people could come together and write on erasable walls, to small intimate rooms and spaces for two people. The large open cafe area is also used for small and large gatherings. The reaction by workers since the Oct. 30 opening has been better than expected, he said. “Myself, I’ve had interactions with colleagues that I would have missed in the past configuration. Now I see them passing and we stop and have a short conversation or we duck into one of the rooms and have that conversation that we would have missed being in other buildings. CNXMotion had a different challenge. 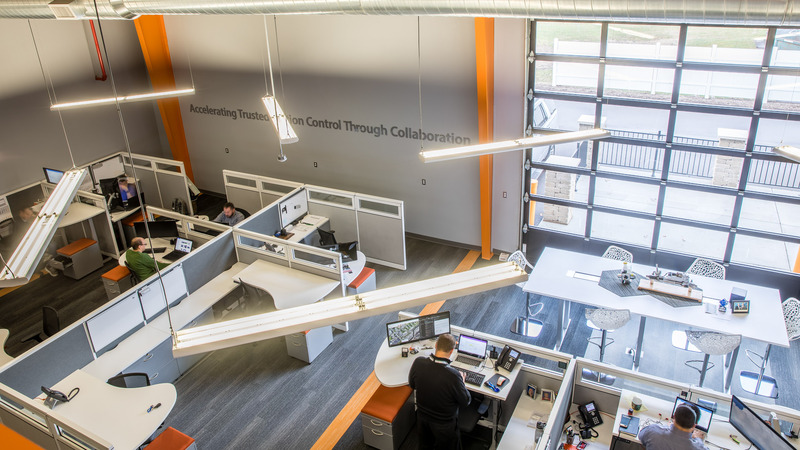 It took over a building on Embury Road in Grand Blanc Township that had been the home to a tool and die shop and turned it into a modern workspace. “When we walked in here there was nothing of what we wanted, but we had a shell, enough space and the right location to turn it into what we wanted it to be,” said Kevin Burns, general manager of the joint venture between Nexteer Automotive and Continental that focuses on vehicle motion control systems. To create that atmosphere, his team knocked out interior walls to open up workspace and changed exterior walls and garage doors to put in windows to bring in natural light. The workspace has modern cubicles with low walls and adjustable desks. Around that space and in a balcony are furnished areas for impromptu meetings of two or more people, and standing workspaces for visitors or for just a change of atmosphere. There is also a large break area with coffee and supplies that doubles as a large meeting space. Of course, there is connectivity everywhere. “People can change their environment, change their thinking during the course of the day to help keep them creative and doing what they would like to do, not distracted by what else is happening,” said Burns. The color scheme is a mixture of orange — a combination of the colors of the two parent companies, Continental’s yellow and Nexteer’s red — and complementary colors. “Orange is an exciting color,” Burns said. And that reflects how he and his new staff feel about their future. When Jason Stoddard and Jason Furr were given the task of finding a larger home for Laird than what it had in Holly, they wanted a building that would change the culture. The old site had very small hallways and “basically was a pole barn stuffed with too many people who were being paid too much to be working in that kind of facility,” said Senior Director Furr. When they couldn’t find an existing building that suited the company’s needs, they turned to new construction. “We wanted a place where people would want to come to and to where we could recruit to easily,” said Stoddard, director of special projects. They compromised by making sure there are private spaces for people to have conversations and have a workspace where they don’t feel packed on top of each other, said Stoddard. They decided to key on things like natural light and open spaces. They wanted employees to be able to see outside yet maintain private offices and meeting spaces. 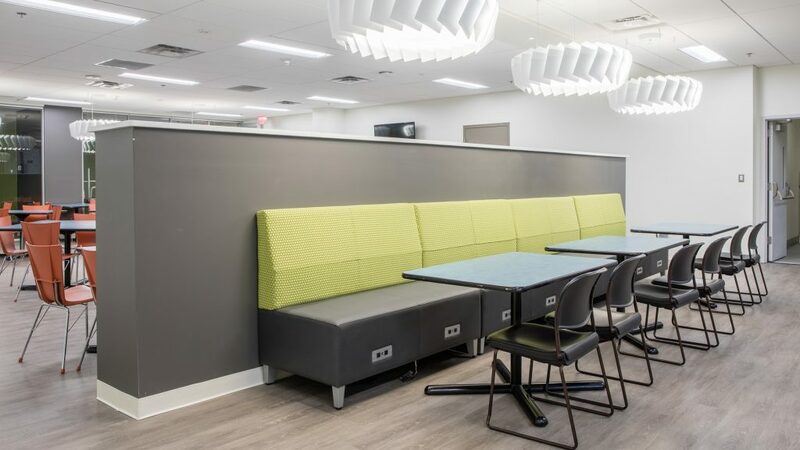 To improve collaboration, they put in bigger offices where meetings of up to five people could occur, and created four “huddle rooms” for meeting of five to seven people. Larger meetings would be held in one of the three conference rooms. They also brought the engineering teams together. In the old building, engineering teams were separated, sometimes by floors. Now all the engineering is done in one big area, so if you need to talk to someone all you have to do is stand up to see if that person is there and then walk over, said Stoddard. They also created more open spaces, a large lunchroom and “think areas” to encourage incidental conversations. Huntington Bank is in the process of remodeling its downtown Flint location with a goal of bringing together teams that are in cross-functional lines of business that have been scattered throughout the building, said Greg Viener, senior vice president and Flint community president. “We brought them together on one floor for better collaboration,” he said. 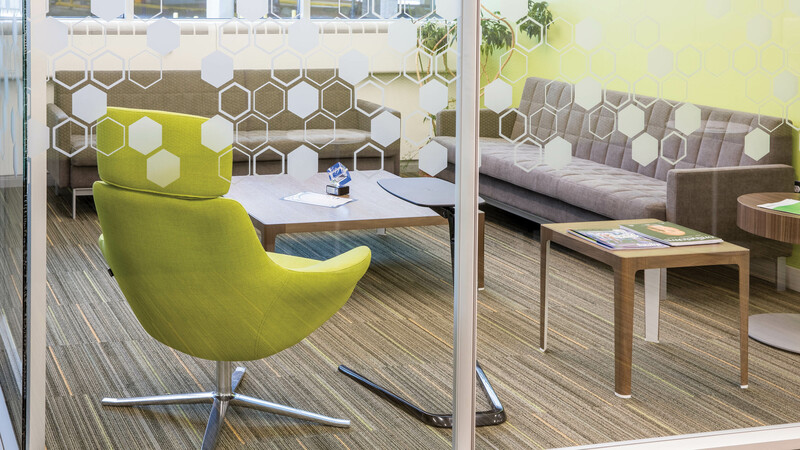 Included in that remodel are offices with glass walls that look out on a central open area with comfortable seating arrangements conducive to collaboration with clients or fellow employees. There also are offices for more private meetings. It’s just one part of a wider effort to enhance collaboration throughout the building to improve business outcomes and customer satisfaction. Another part of the building remodel is focused on the phone bank center, where 200 employees take calls from Huntington customers across the region, said Viener. Each operator has his or her own modern workspace so that they can be coached more easily by a team leader or captain. 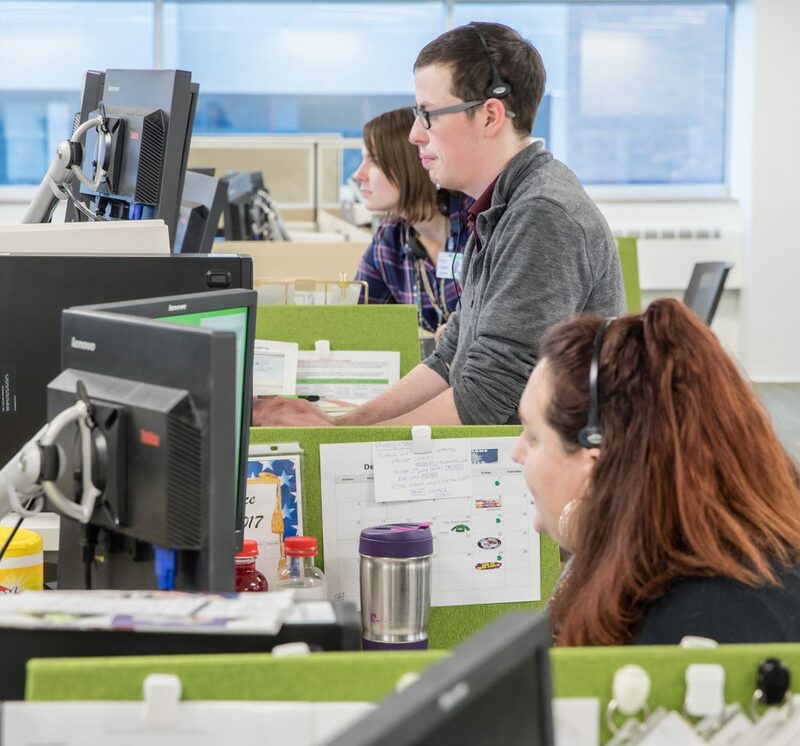 They have height-adjustable desks and rolling file cabinets for better flexibility and comfort, said Cindy Wilson, site manager for the phone bank. The lighting is both natural from large windows and soft overhead fixtures. The workers used to be in cubicles with high walls, she said. The area was darker, as light couldn’t penetrate into the workspace because of offices. The area also has private rooms for making personal phone calls, and each floor has its own modern area for breaks and lunches. Beyond those areas, Huntington is renovating a large space for a cafeteria. “It will serve as kind of a town hall area,” Viener said. It will also have some large meeting rooms.